Study: MSc degree in Biology from the JMU Würzburg (Germany). Currently: PhD student in the Biophysics and Quantum Optics group, Leiden University. 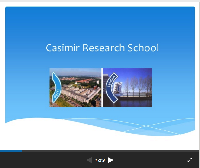 "Casimir supports us in building a network, which will be valuable for our future career paths."